Luggage straps are not only a great way to assist in luggage identification, but straps for luggage also help to secure overloaded bags whose zips are in danger of bursting. 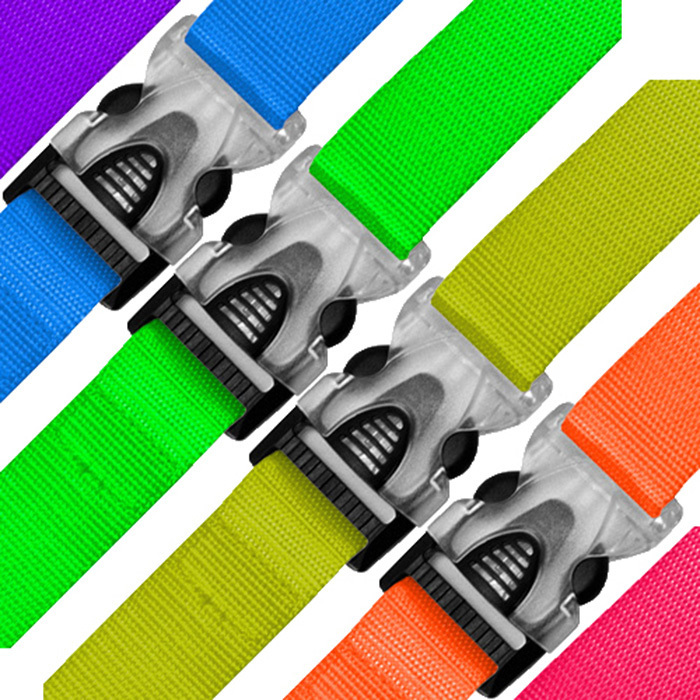 Our range of straps for luggage are made from tough and flexible nylon, and are long enough to fit around the largest sized bags allow through airports. They are adjustable and have a non-clasp so ensure your straps for luggage are fastened at all times. Due to their adjustable nature, our luggage straps turn into custom luggage straps for your bag! Luggage identification is made much easier with luggage straps, especially the straps for luggage that we have in the bright colours. These days, most luggage cases are black or silver and all square. Trying to spot your tiny luggage tag amongst all the bags can often be difficult, so use a couple of bright luggage straps for easy luggage identification!